This tutorial shows how to create and send a PDF document via e-mail using novaPDF Professional edition and examples on how to configure the email for sending to the Kindle and IPhone mobile devices. novaPDF is a PDF creator that allows generating PDF files from any Windows application that supports printing. If you don't have novaPDF installed, use the Download page to download and install it. 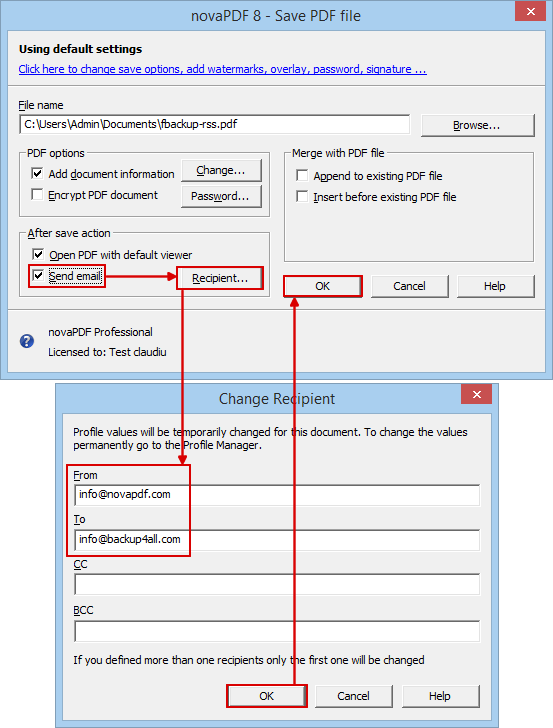 Any PDF document created from another file format can be sent via e-mail if you choose so. However, this option is only available in novaPDF Professional. Sending the document in PDF format is an advantage when sharing the file with other users (in this case, the user does not need to install the program used originally to create the file) or sending it to mobile devices such as Kindle or IPhone as the devices only recognize certain file formats including PDF. Once you have novaPDF installed, the process of creating a PDF from a printable document is as simple as clicking the Print button. 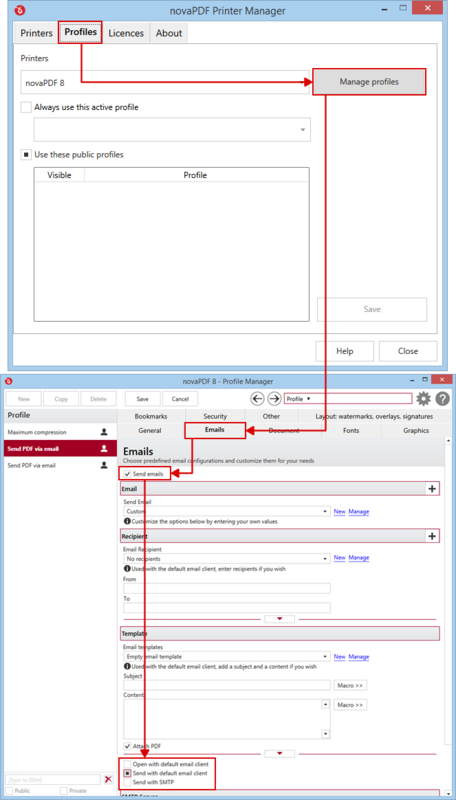 novaPDF has an option that allows you to send a PDF via email once it's created (this can be done automatically with no further input from your part). Open Printer Manager (go to Start and type "novaPDF printer manager" in Windows 8, or go to Start->Programs->novaPDF in Windows 7 or previous) then click on Profiles->Manage Profiles. c. Send with SMTP: If this option is selected, you have to configure the SMTP server and the e-mail address you want to use for sending. Fill in the Recipient section which email addresses you want to send the PDF to and under Template select the subject/content and attachment options for the email. Click on the Save button to save this printing profile. The new profile will be available for other print jobs as well and if you define new ones you can switch between them from the Printing Preferences window. After the printer has been selected, click on Print and choose a location where to save the PDF document. Kindle is a wireless document reader manufactured and distributed by Amazon. The first versions of Kindle (1 and Touch) do not offer support for opening 3rd party documents (such as PDF files) but only documents that are in a proprietary format (AZW). Sending PDF files to a Kindle 1 or Kindle Touch device requires emailing the PDF first to Amazon where after a conversion into AZW format it will be sent to the Kindle device where you can open and read the contents of the former PDF file. The newest versions of Kindle (DX, Keyboard and Fire) can view other document types, so opening PDF documents on them is done without any additional conversion. This means that in order to view PDF files on Kindle DX, Keyboard and Fire, you can transfer the PDFs via a wireless connection from your PC. To read more about this, see the Send PDF to Kindle article. IPhone has an internal email program that can access any POP3 or IMAP email account. Since it also offers support for viewing PDF, Word, Excel and PowerPoint attachments, sending a PDF file to your IPhone is as simple as emailing it as an attachment to the email account used on the iPhone. This tutorial shows how to create and send PDF documents via e-mail using novaPDF and examples on how to configure the email for sending to the Kindle and iPhone mobile devices. If you have suggestions on how to improve this article add a comment or rate it.